This is an easy question for me this year… vacation. In fact, we just got back from vacation, so it’s fresh on my pocketbook mind. I commented to my husband that I didn’t see how big families could afford to go on vacation. I do know that you can do it on a loss less money than we did (we have before). But we did a full 7-day vacation and it was our first “real” vacation in a few years. So we splurged. Summertime brings about several things that are exclusive to this time of year, some of which can be costly. From vacations, to back-to-school shopping, to planting a vegetable garden or summer sports for the kids, it adds up. As I mentioned, we already took our summer vacation this year, and it really does add up quickly. Especially at tourist destinations. Just eating out is higher. But we had so much fun! It was relaxing and our son had an incredible time. I think I’d prefer to go a little later in the summer next year, but our schedules wouldn’t allow it this year. Now I have a few weeks before it’s back-to-school shopping time. If you’re like me, a little extra cash would come in handy this summer, whether it’s for vacation, back-to-school shopping, or mad money… and I have some great news. A few fellow bloggers and I have come together to offer YOU a chance to win some cold hard cash. Enter to Win this Amazing Giveaway! 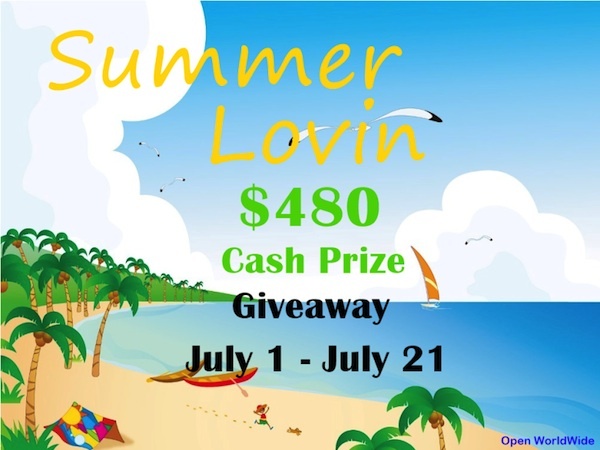 One lucky winner will win: $480 Cash via PayPal! Please enter on the Rafflecopter form below, as many times as you wish. Good luck! Disclosure: Blog by Donna is not responsible for prize fulfillment. I would use it to buy a few things I need for the house. I spend most money in the summer on a vacation…. If I won now, I would pay off a portion of my credit card!! I spend the most money in summer on grilling food and outdoor entertainment. And right now I would use the money to buy more outdoor furniture. Sounds like you had a wonderful vacation Donna! And you are right, the costs add up quickly, but the memories you create with your family are worth it. Groceries and a trip into see my grandson. This would help us fix our roof! I would spend the money on my largest summer expense : groceries. I’d also put some of the money towards a store bought pool for my children. I spend in summer mostly on groceries. If I won, I’ll use it to pay bills. I would pay my bills! Boring, but true. I probably spend the most money in Summer on activities with my kiddos and If I won I would probably take the kids to a waterpark =) Thank you for the chance! Your AWESOME For offering this! I probably spend the most money trying to entertain the kids. I would probably use the money for back-to-school shopping for my kids. i would use to get car fixed. We spend the most on vacation, gifts for grads and weddings…the things of summer. I’d help my husband with a hospital bill with the money. If I was lucky enoughto win the money, I would put it toward payment of the new laptop I had to buy.Thanks! Would use it toward car repairs. I could actually use the money for bills and groceries. I spend the most money on food and electricity. I’d use this to get the tags on my car done. As it is we are saving to afford it. Thanks! In the summer our money goes to running the a/c. I would use this money for bills. 8 would spend it on driver’s ed for my oldest Andy the kids birthdays. All three have birthdays in July. Sadly I would put it towards bills since we have already had our big spend at the beach this summer! We spend the most on Groceries. With 7 kids to feed 24/7 it seems like we need a crazy amount of food. Second is electricity and water for the pool. This year the bulk was spent moving, next year it better be vacation! At this point and extra money is going to back to school clothes… I just got the boy a new wardrobe about a month ago, then he had another growth spurt! If I won I would spend the money on materials for my kitchen renovation. We spend the most on a vacation and if I won the money, I would save it for my son’s college fund.